What did you think of The Unknown Soldier / Infra / Symphony in C? The Unknown Soldier / Infra / Symphony in C runs from 20–29 November 2018. Tickets are now sold out but tickets will be released on Friday at 1pm as part of Friday Rush. This production is staged with generous philanthropic support from Julia and Hans Rausing and the Friends of Covent Garden. Resident Choreographer Wayne McGregor is generously supported by Linda and Philip Harley. Unknown Soldier is generously supported by Marina Hobson OBE and the New Choreography Syndicate. Infra: I know these dancers are incredibly strong and flexible, but I feel that this work (and much of McGregor's output) simply uses them as hyperextended bendy dolls. Symphony in C: magnificent. I thought all the principals were excellent, with a particular shout for Alexander Campbell. What a terrific end to the evening, and I really hope that this work (and other Balanchine) will be staged again next season. Unknown Soldier : beautiful and moving with a coherent dramatic integrity. Lyrically danced. Infra : dull, shallow, movement without any emotional heart. A dreadful waste of wonderful dancers. Symphony in C : Gorgeous, the whole cast shone and I loved the contrast between the different principals. Unknown Soldier enjoyable and moving but WHY have the curtain call behind the scrim - bad idea. Infra mesmerising and Symphony in C wonderful. Liked the dancing and choreography in the Unknown Soldier, particularly the PDD. Not a memorable classic though. The film show on the scrim curtain and accompanying noise effects didn't add value for me. Infra I had more trouble with; thought that it would be interesting to dance but was left thinking that Richard Alston and Michael Clarke were doing this stuff 20/30 years ago. Too much 'Groundwork' and 6 great musicians, over-amplified and drowned out by a radio hiss (thats been done lots in the past too!). Symphony in C was very Jolly, music and design were uplifting and Balanchine did his thing. All that said, I had a terrific evening because the cast of all three productions were on fire. It's just great to show up and have these incredible dancers and supporting artists feed me. I thought The Unknown Soldier was very poor. Obvious and sentimental, it didn't do justice to its WW1 theme or its wonderful dancers. The rest of the programme, however, was brilliant. Wayne McGregor's Infra was stunning - thrilling and deeply moving. A modern classic. And the dancers met the challenge of the choreography beautifully. Symphony in C was also a triumph - the whole company in tremendous form. Balanchine is unbeatable. I think new choreographies are very good for the enrichment of everyone involved and the audience too. Maybe this combination of Mc Gregor and The Unknown Soldier did not work since, first, it's still hard for people to assimilate Mc Gregor works, and second, The US was kind of poor. There you have one brilliant piece of Balanchine work with two "hard to like" pieces. I agree that you should perform more Balanchine, maybe two works annually. It's interesting that Unknown Soldier and Infra have both provoked such mixed reactions. I'm with those who found US engaging and moving - and I intriguing and compelling. Symphony in C, as most people seem to agree, was just enchanting from start to finish. Overall, I thought it was an excellent programme, and I agree with Keith B - a terrific evening because of the superb dancing throughout. A special mention for Yasmine Naghdi for her beautiful performance as Florence - and her adaptability and stamina appearing in all three ballets! The whole company were excellent though - congratulations to everyone involved. PS Agree - the scrim does spoil the curtain call. The unknown Soldier was totally brilliant. Captured the very essence of the memories of the dreadful war. The dancing was spectacular and Alaister ‘s interpretation went to the very heart of the suffering. Very moving. Felt it should have been the final ballet of the evening. Felt emotionally exhausted. Having thoroughly enjoyed the insight evening about The Unknown Soldier, I found the actual performance very disappointing. Not only were the many special lighting effects distracting, but the scrim used for their projection obscured half the stage for those of us who sit in the amphitheatre. As this section occupies about a third of the audience, I found it unbelievable that nobody had bothered to check the view from this area. Leaving the scrim down while the dancers took their bows was a terrible idea. It created a barrier between us and I found this incredibly disrespectful. I do not enjoy Infra so thank heavens for Balanchine's Symphony in C. Finally a ballet that didn't rely on special effects to entertain its audience but could wow them with choreography alone. Wonderful dancing, great music, lovely costumes and no scrim obscuring anyone's view. It certainly saved the night for me. I agree with Bridie's comments about the designs for Unknown Soldier. I was in row a of the amphi last night and even from there the back half of the stage was largely obscured for much of the ballet. Loved the concept though and the dancing was superb, especially Yasmin . It was nice to see Infra with a new cast; Akane Takada was particularly striking. As for Symphony in C, it was simply glorious. Wish we would see it more often. When my comment of the 21st November (see above re Infra) was published, I reread it and realised that I came across as negative of McGregor's choreography generally and not specifically. Nothing could be further from the truth; it's just that I have increasingly high expectations of him. I'm of the Tribe that believes that physical freedom, intellectual and moral sophistication, and precision (or do I mean technique), active and reactive, are to be found in the best contemporary dance. My instinct is that McGregor and the RB (thanks Mr O'Hare) are in a very, very good place right now to push the boundaries. I, for one, would like to see that happen because it's rare to have the opportunity to build a contemporary form on rock solid classical foundations (don't jump on my neck, I want to keep classical foundations). PS I saw Kevin O'Hare with Mark Rylance in the Crush bar a few weeks ago. I goggled at them like a Groupie whilst thinking that those two super talents wouldn't be selected on emploi! I'm so glad that we have more than one lens through which to view talent, it echoes my point about McGregor really. Sadly, unknown soldier was clichéd and dull, although technical execution could not be faulted. Infra very enjoyable but over flexing of dancers is becoming questionable. Classicism triumphed in Balanchine piece, stunning, stush and deliciously brilliant dancing throughout.!! I want to add to the positive comments about the Unknown Soldier. Having attended the Insights evening a few weeks ago, I was very interested to see how the ideas worked out in the finished ballet. I found it incredibly moving - particularly Anna Rose O'Sullivan in the cast I saw. I don't understand the comments criticising taking the curtain call behind the scrim. It seemed to me deliberate and entirely appropriate given the title of the ballet: The Unknown Soldier. While the story focused on 2 individuals we know about, it stands for the thousands of other individuals who either died or lost sweethearts in the war, and for me it was right that the principals took their curtain call as it were anonymously. This piece was not about celebrating dancers' virtuosity and loud applause, it was about the sacrifice thousands and thousands of people made in the name of their country. If anything, It could also have worked to have had no curtain call at all - personally I felt like a thoughtful silence would have been best - I know several of the audience around me didn't feel ready to applaud the moment the curtain came done. As a whole, I thought the evening was very well balanced. I enjoyed Infra very much and I wondered how the Balanchine would work after 2 relatively dark pieces. In fact, it was a triumph and everyone left the theatre feeling uplifted. I would like to single out Beatriz Stix-Brunell in the casts I saw. She was outstanding in Infra and again in the Balanchine - for me she completely captured the very different styles of both. She is a very versatile and expressive dancer, and always lights up the stage when she performs - I hope she may be promoted to principal soon. Expected a lot from Unknown Soldier but it did not deliver. Nothing remarkable about the choreography and although faultlessly danced, it lacked much emotional punch. Wed 28th performance. Just when you thought things couldn't get any better, along came Symphony is C. Yes, Beatrix was brilliant, as were many others and I took particular note of the young guns, with Chisato Katsuri and the youngster Sae Maeda looking extremely good. I spotted Christopher Saunders in the audience for his Symphony staging and it would be interesting to here if his take was as enthusiastic as mine and the whoops of delight from the audience. I wished that each performer could have come back and gone through their routine separately, at some points there was so much talent on display simultaneously, it was difficult to know where best to look. I'd been expecting a lot from The Unknown Soldier after seeing the beautiful pas de deux danced by Francesca Hayward and Matthew Ball in May, and the ballet delivered. 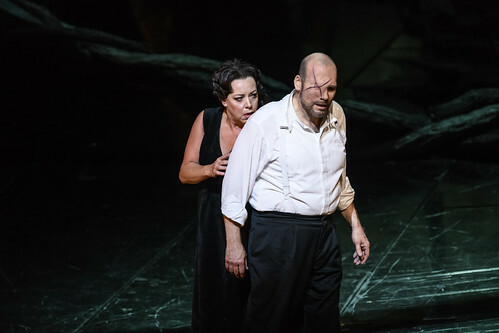 I didn't love every bit of it, but I found most of it - the sections with Yasmine Naghdi and Matthew Ball as Florence and Ted immensely moving, as well as the parts where Ted has to join his regiment, their sorrowful parting, Ted's death and Florence's heartbreak on receiving the news of his death. Ball is excellent in his dignified portrayal of Ted (without overdoing it) and Naghdi absolutely incredible at being able to portray the joy and passion of Florence in love, and her anguish when receiving news of his death - what a powerful actress and dancer she has grown into. The ballet is worth watching for her alone, but the duets are beatiful too, as well as the Dario Marianelli score. Infra is now a popular classic around the world - acclaimed after its Royal Ballet premiere 10 years ago, and danced by the Australian Ballet and Mariinsky Ballet to great acclaim. The original cast that included Marianela Nunez, Yuhui Choe, Edward Watson, Eric Underwood and Melissa Hamilton were outstanding, but I also enjoyed the new cast this November- Naghdi was particularly moving at the performance I attended. It's not meant to be Balanchine or Ashton - just like MacMillan never intended to be Petipa or Bournonville. It's ballet about urban life in the 21st century, and it's compelling and eloquent. The cast (led by Cuthbertson, Muntagirov, Nunez, Hirano, Takada, Campbell, Naghdi and Zucchetti at the show I attended) were brilliant in Symphony in C. A timeless classic danced by a superb cast of leads and ensemble. Fantastic. It's a sign of a successful triple bill that I wanted to get more tickets to see the other casts, but the remaining shows were all sold out. That sums it up! I saw the triple bill on opening night. I felt the Unknown Soldier, although quite beautifully danced, missed the point. The title brings images of lost people. Those who died and were not recovered, those who were recovered but not named. The film clips and the delivery of the telegram seemed to indicate soldiers who were known. However the dancing was wonderful and I enjoyed the piece overall. Infra was a good idea and naturally well danced. I liked the digital stuff although I was glad when it ended as I found the electronic sequencing very hard to listen to. I enjoyed the programme had a memorial piece, a classical and a more modern piece. It provided something for every taste. 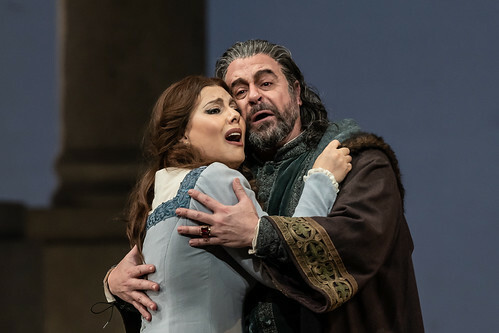 Your Reaction: What did you think of Verdi's Simon Boccanegra 2018? Audience responses and press reviews following The Royal Opera's production, directed by Elijah Moshinsky.